Wash, peel, and dice the Sweet Potatoes and set aside. Cook the Bacon until crisp. Reserve the fat. Pour all of the Bacon fat into a large cast iron skillet and heat to Med-High. As the fat heats…peel and crush all of the Garlic into the pan. Add the Sage, and Salt and Pepper to taste (about 2 Tsp of each). Once the Garlic is browned, add all of the Sweet Potatoes and cover for 15 minutes…cooking at Medium heat. Add the Sesame Seeds and stir….reduce heat to low. 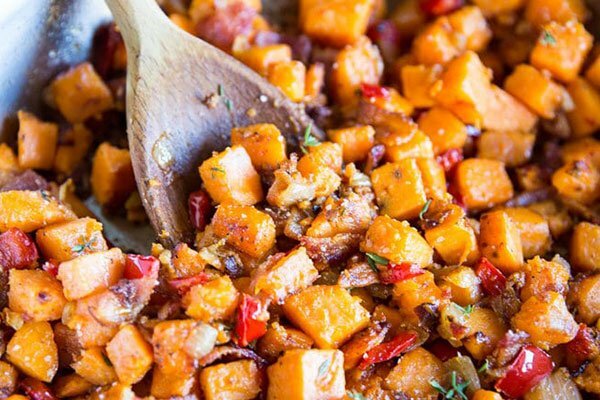 Crumble the Bacon and fold into the Sweet Potato Hash. Leave covered until ready to serve. Add the Heavy Whipping Cream, a dash of salt, and the Maple Syrup to a sauce pan and cook at medium until the sauce thickens a little. When ready to serve, ladle a little over the finished dish. Chorizo can be used in place of Bacon.